This is a part of important milestones in my career, the link between International Islamic University Malaysia and Karabük University is such a blessings! 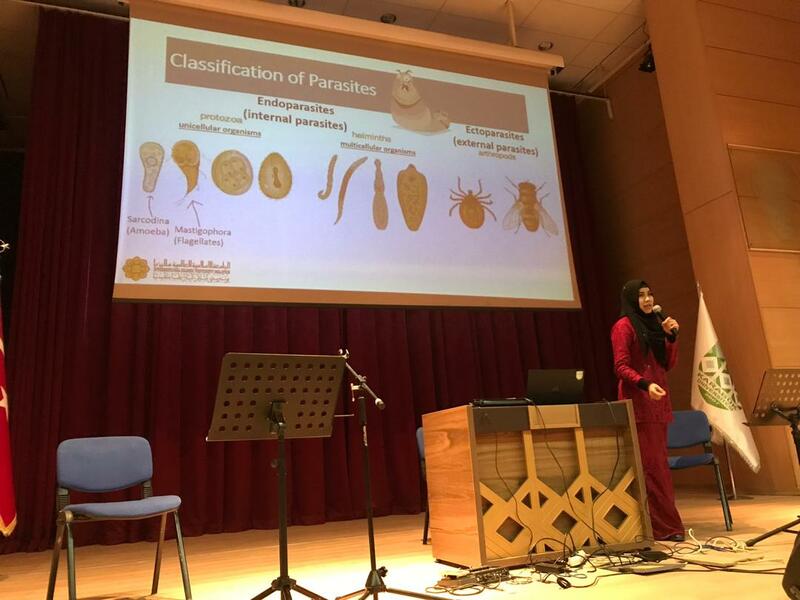 I am Associate Professor Dr. Afzan Mat Yusof specialised in Molecular Parasitology, at Department of Basic Medical Sciences, International Islamic University Malaysia (IIUM) sharing about my passion and reality as a Parasitology scientist, academician and my short presence in Karabük University. Let me say like this, I am not a good speaker, a good writer or a good thinker. Sometimes, I feel something good happened to me just for a reason. 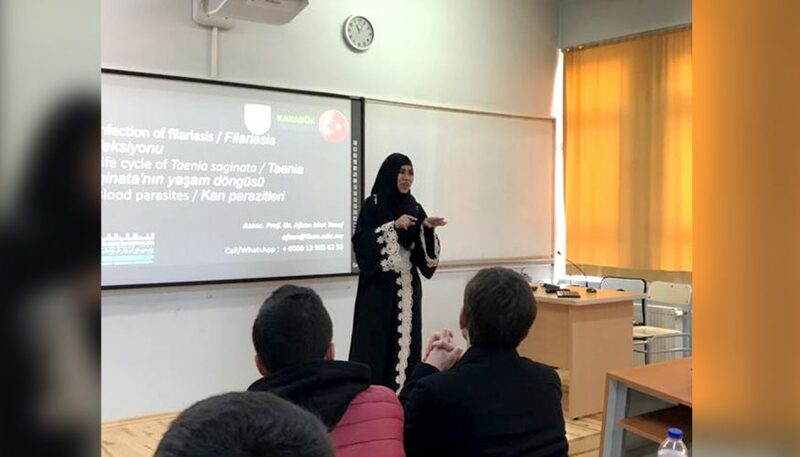 The reasons that trigger me to join Mevlana Mobility Teaching programme is that I want to share my thoughts and knowledge, learn and experience the differences between two cultures and explore the possibilities that might be a new path for me. I am not going to live in this world forever. The death time has already fixed and there is nothing I can do about it. I still remain the same, I still live in my world with research, work, and routine life. I want to move out from my routine environment and gain new experience. I want to see the real world, real people, real environment and real achievement. As many other academicians, I just tried my luck with the hope that I will be selected for that programme. Of course the chance is like 1 in a million because I have to compete with other academicians all over Malaysia. With the bless from Allah and HIS will, I have been selected in Mevlana Teaching Mobility programme and I were placed at Basic Medical Sciences, Faculty of Medicine, Karabük University. I have decided to visit Karabük University in Spring between 3rd March 2019 – 16th March 2019 and here I am at Karabük University! 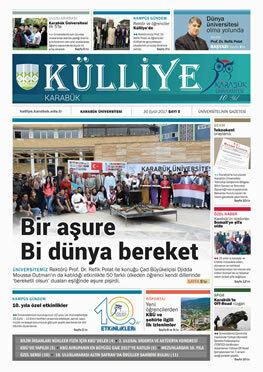 Honestly, I only aware that Karabük University is located at the northern region of Turkey. I do know that Karabük University is very well known university that offer outstanding courses especially in engineering field. Nothing much I know about Karabük University until I step into it and experienced it. Honestly, when I step my foot to Karabük University, the first building that I visited was Rektörlük building with majestic architectural structure and high level of security that present as the centre of attraction of this university. The view is breathtaking and difficult to explain unless you step into it. And no wonder there is a large assemble area with Ataturk statue and Turkish people statues are placed as perfect spot of attraction to show the blood and sweat to build their nation; unbelievable! Every faculty building is adapted to the overall architecture with global trends and modern touch and it is in harmony with the natural surroundings. Since, I have been placed for 14 days in the Department of Basic Medical Sciences, Faculty of Medicine, all I can say this 4 floor building has unmistakable style of architecture. The learning environment is also very conducive with very well equipped lecture halls and classrooms in order to enhance teaching and learning. Besides, I had attended the open ceremony for new semester of Faculty of Medicine on 14th March which was held at Safranbolu campus. The ceremony was officiated by the most respected Rector, Prof. Dr. Refik Polat. Although, I know the programme is conducted in Turkish language but I do eager to be a part of it. It is an honour to witness the diversity of different cultures and races but yet holding strong bond as one family. One of the most signature impact during the event is when the Turkish National Anthem has been played. That was the first time I listened to Turkish National anthem and my heart started pounding really quickly! I feel like I am going to war with high spirit patriotism. This kind of spirit has certainly impacted on me until now. Through google maps application, the distance from IIUM to Karabük University is 10,523 km which takes about 2,149 hours or 3 months by non-stop walking. Imagine the distance is too far and yet it is close to my heart. In life everyone has an unspeakable secret, an irreversible regret, an unreachable dream, an untold stories, an unforgettable love and undeniable desire. So do I. Love, friendship and kindness are splendored things taught me lessons along the way. Despite difference in language, culture, races and customs but sharing one love. One thing that I have learnt from Vice Rector and Dean Faculty of Medicine, Prof. Dr. İbrahim Kürtül said during lunch break “Turkish people are bond with each other. We are like one family.” The statement gave impactful that how strong relationship bond from one to another which I could only wish I can be a part of it. This deliberate, mindful connection building helps deepen the sense of connection and attachment. As a coordinator for International Relations Office, Oya Önalan Hojam, she is the first person (woman empowering leadership) I met at the Rektörlük building. With very strong personality and committed woman that holding multiple responsibilities are definitely very challenging tasks but she managed to put her smile and warmth welcome the moment I was there. I do respect her much. Trust me, I see beautiful people around me during my visit. Although, one of the main challenges is language barrier but how Turkey people treat me as a guest is beyond believe. For instance, Adnan Ucur Hojam from International Relations Office, Erasmus + Outgoing Student Mobility, who is willing to assist me tremendously during my stay in Karabük. He and his family treated me as one of them and it is an honored to experience this. I will always remember their love and care. Not to forget, Memur Regayip Gençtürk from Mevlana Exchange Programme who is responsible for my documentations during the mobility programme. Really appreciate his effort and hard work. To my best friend, Assist. Prof. Dr. Feyza Başak (Head of Department), for making me smile and happy all the time. Thanks so much for sharing research and knowledge with me. To Simge Acar Turgut who is always served the best coffee in the Department of Basic Medical Sciences, Karabük University! Besides, through this programme, several respected academician who treated me as family are Prof. Dr. Seyit Ali Kayiş (open to new possibilities in research) , Assist. Prof. Dr. Zülal Öner (Vice Dean) and Assist. Prof. Dr. Muhammed Kamil Turan. Not to forget, my thanks to Assoc. Prof. Dr. Tahir Kahraman, Assist. Prof. Dr. Yusuf Ersan, Assist. Prof. Dr. Ahmad Yahyazadeh, Assist. Prof. Dr. Eyüp Altinöz, Assist. Prof. Dr. Mehmet Demir, Assist. Prof. Dr. Özlem Cesur Günay, Assist. Prof. Dr. Emre Taşkin, Assist. Prof. Dr. İsmail Haskul, Assist. Prof. Dr. Nergis Aşgin, Assist. Prof. Dr. Elçin Kal Çakmaklioğullari and Assist. Prof. Dr. Cüneyt Kuru for their continuous help and supports. My specialization is Molecular Parasitology, graduated from Faculty of Medicine, University of Malaya. Through this mobility teaching programme, the general course is Basic Medical Sciences but specific teaching in Medical parasitology for 1st year, 2nd year and 3rd year students. Parasitology is defined as study of parasites which include its morphology, characteristic, life cycle, clinical manifestations, pathogenesis, treatment and prevention. The term of parasitology may be difficult to layman but not to the medical field. In general, It is like capturing the hidden tiny or micro creatures that look harmless via naked eyes but malicious and ferocious. It creates thousands questions on how these parasites are indeed transmitted from one to another and finally, succumbed to the disease. Parasitology is not merely to a study on parasites. Parasites are mostly neglected, under reported and remained silence diseases. The truth is parasites are not restricted to poor or underdeveloped area but also to high status or developed one. In fact, there are many ongoing research in parasitology done in developed countries to eradicate parasites. It just that people are not aware of the parasites existence which is remained neglected. As an academician, it is not only my duty to share my knowledge and experiences pertaining to parasitology to the students, but how to instill in their mind to become a medical doctor who can contribute to society and also other related field. A great future medical doctor is not about treating parasites in infected patients but how to contribute idea, plan and knowledge to combat any parasitic diseases issues in his/her country by involving multidisciplinary field towards betterment society. When we were young we were ripe and we absorb as fast as porch desert in a rain storm. We want to learn and we are hungry for knowledge. But at this age, we usually mark and scrutinize for our skills in numerously, in sciences, in literacy but we don’t realise that the importance of soft skills. The important of connecting people through communication and networking is matter the most. The most important is to “link the outside to the inside, the inside to the outside.” Although I have graduated in biomedical sciences with the specialization of Molecular Parasitology, I am only good in my field but I may not good in other fields for example biochemistry, physiology, pharmacology or many more, so other people too. They may be good in their fields and may not good in certain fields. If these people integrate together via sharing knowledge, ideas and applied this knowledge and I am sure we can make beautiful things come out form it. Just bear in mind, it is okay to start with small research team and topic because something small may give great impact or contributions to the society. The key point here is start something! In the end, in research, I cannot work alone, we cannot work alone and everyone cannot work alone. Those who believe that they can work alone, know every field and know everything are obviously “too good, to be true.” Honestly, I maybe good in parasitology but I am not good in other fields and that is why I need other experts to complement the research to make a better world to society. Today, many issues are rising for examples in medical field; health issues, such as in my field, the parasitic diseases such as Leishmania and Echinococcus in Turkey are still unsolved and keep on rising. Echinococcus or liver tape worm infection is poorly understood and many Turkey infected people but without any signs and symptoms. It is not easy to tackle this infection since it can be transmitted from ruminants (cattle, sheep), domestic animals (dog especially), rodents (rats), agriculture (vegetables and fruits), environment (water, soil) and wildlife (fox). In fact WHO, (2018) has stated recently the need of new approached in order to tackle parasitic liver diseases. From this how come we respond positively, it can respond if we merge together, create a network, share knowledge, ideas and taught and change it into meaningful things that can bring beneficial to others. Interdisciplinary field for example, the exploration of anatomical changes, histological changes, biological changes, physiological changes in liver (either in infected patients, in infected animals, in contaminated environment) with Echinococcus with different molecular definitely will be successful collaboration between International Islamic University Malaysia and Karabük University. Besides, how do we spark our research and ignite the research by linking with other disciplines also possible. The networking between medical field with engineering, finance, psychology, education, law and many more is definitely can be achieved. For Echinococcus infection, let’s say for example mechanical engineering experts could think of the development of machine for agriculture or soil to eradicate the echinococcus at infective stage (egg) since echinococcus can contaminate vegetables and soil. The finance and economic field could do a study on the impact of Echinococcus infection in terms of profit or sale related to ruminants infected with this infection. Other field like psychology, the evaluation of behavioral changes among patients infected Echinococcus with healthy individuals with various factors associated with the transmissions through qualitative and quantitative study also bring meaningful findings. Meanwhile, in education, the development of simple booklet or modules to society with regards to this infection do educate society and increase their awareness related to this infection. In linguistic, the development of booklet and modules can be translated to other languages in order to share knowledge to broad readers. In law study, the development of policy health related parasitic infection specifically Echinococcus to be implemented in the government can bring impact to the reduction of this infection. All in all, there are many studies with various disciplines can work together via “one” parasite topic itself. Putting the whole perspective bring the all various field work together and to see how that can be harmonized. It is not about what can I gain from this but what can I contribute to this. Focus on the present in order to create better future for everyone. I do hope it is not just about teaching programme but also collaboration in research between International Islamic University Malaysia and Karabük University that can foster excellent collaboration in research and innovation together. Although the language is different, I do believe it is workable because we can’t direct the wind but we can adjust the sail.